I’m taking Derby out to a schooling show next weekend. We’re not ready for much and are just going to do walk-trot tests. Why am I bothering? I’d like to take him out and about, and it will be fun to ride in a full size arena. On the up side, the new saddle is working well for him – he’s not sore and is working comfortably. But we have just two weeks of introductory work, and are just working up to 40 minute rides. 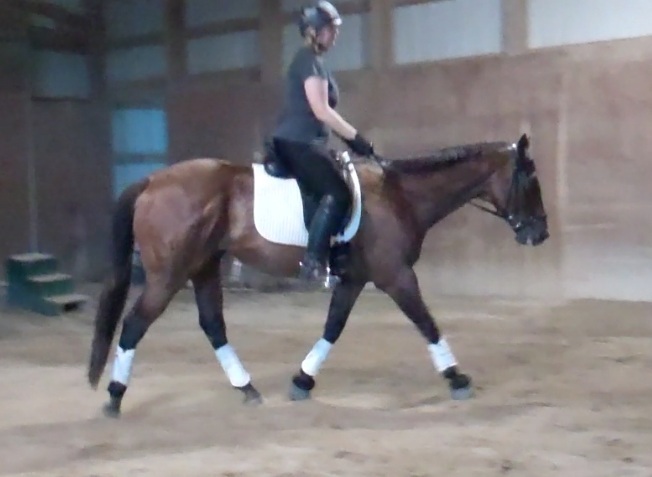 Gait quality is an issue, my riding is still rusty and we both have a long way to go in terms of fitness. Ugh, we are so not ready. 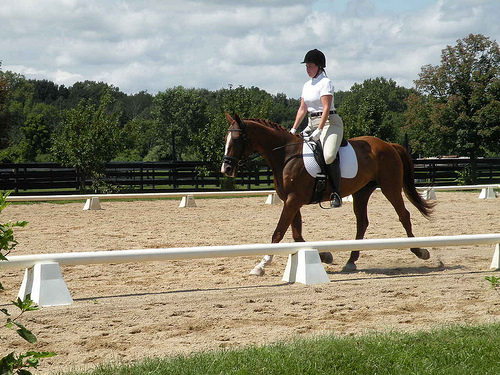 We’re focusing on getting Derby in front of my leg, gait quality and transitions in my lessons. The pressure of a show – even a schooling show – is undeniable because I’m a bit of a perfectionist and Type-A sort of critter. 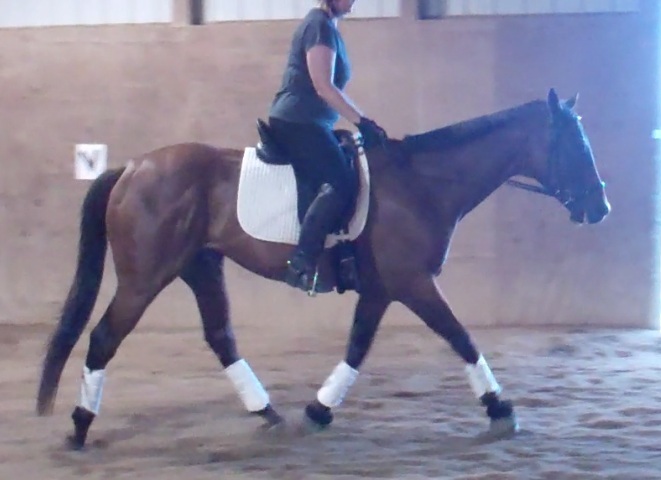 In actuality, this may work out well, because these three things – getting the horse forward and generating quality, correct gaits and riding lots of transitions are exactly what I need to get down to build Derby’s condition and move forward in our training. But dang, I have a long road ahead of me. 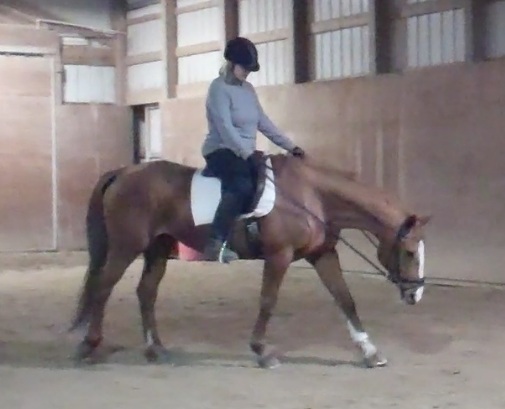 For the last couple nights, Christy has had me focus on riding from my core, while also asking for forward, keeping my hands quiet and bending the horse into the outside rein. This is all basic stuff, and ten months ago, these movements were instinctive. Presently, that’s not the case. I feel like I’m multi-tasking and it’s tough. Christy has been drilling me and man, I am feeling it. My abs are sore and my legs hurt too. I spent extra time giving Derby a little massage tonight and hand grazing, because I bet he’s feeling it too. The instructions come rapid fire from the middle of the ring. Hold my reins. Steady my hands. Close my fingers. Leg on. Ask for more. Make it happen. NOW! Bend him. Inside leg. Come on, bend! There! Leg on! A respectable trot, though I need to sit up straighter, engage my core, and round the horse. Importantly, the urgency of the looming outing is really helping me focus on forward, gait quality and transitions. Who knows when we will make our recognized debut – that is months and months away – but I promise you, we will be fit, forward and correct when that happens! Now, off for a warm shower and some advil. Dang trainers. Tonight I flat out felt like hell in the saddle. I’ve been working out, trying to un-do the fitness collapse my two weeks off and a bout of the flu brought. Today, despite the fact I had a lesson, I did an awful cardio-step workout that kills my legs. Tonight was no exception. My muscles were tired and sore. I mounted up and we got to work – but immediately, Christy spotted something weird. 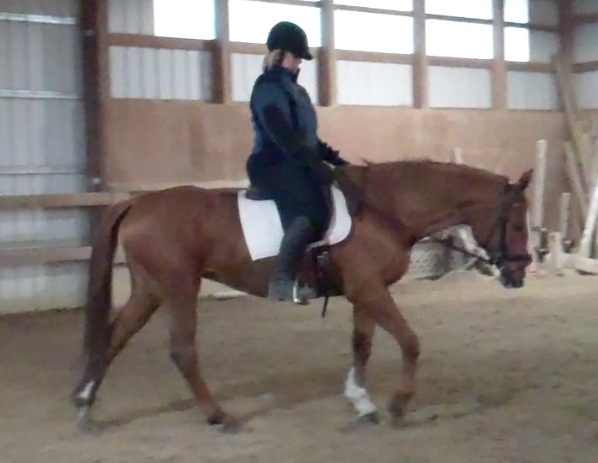 I was curling my leg back, towards Maddie’s flank, as we trotted around in two point, warming up. She alerted me to the problem, and I tried to fix it, but it wasn’t happening. I started to post, and that didn’t help either. We dropped to a walk, and I kicked free of the stirrups and let my legs hang a minute, then started rotating my ankles and stretching. Ahh. That felt good. After a few minutes, I put my feet back in the stirrups, and Christy gave her seal of approval. Off we went again. Clearly, things weren’t working for me tonight. I started curling my leg again, and things still felt awful. I dropped the stirrups again. 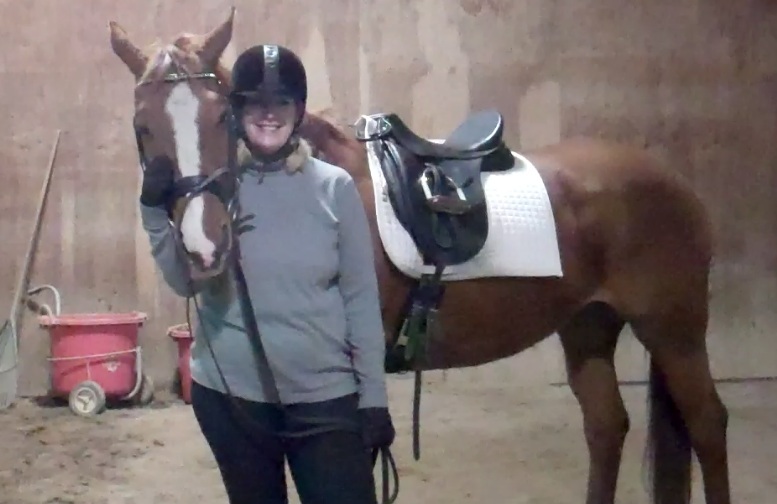 And then, because one of my resolutions is to just shut up and ride, I said to Christy, “Hey, I want to try something.” I nudged Mads into a trot. While I was too busy staying focused on the horse, I think I did hear Christy’s jaw audibly drop and hit the ground. 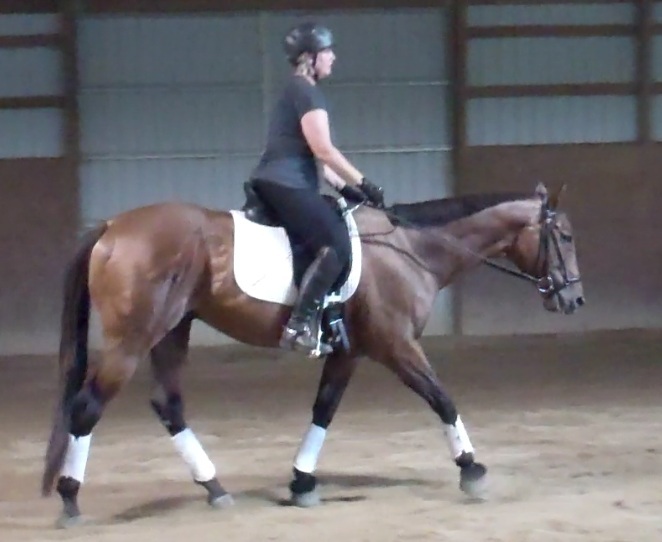 She’s been trying to get me to drop the stirrups for, oh, months …. maybe even years. 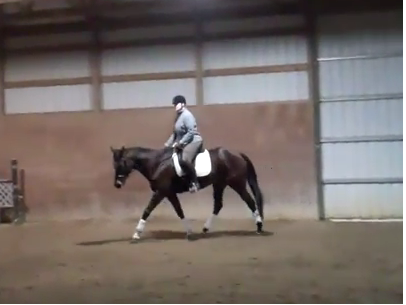 Mads has a trot I can ride without stirrups. I never contemplated dropping the stirrups on Jag, who had a trot that felt like a pogo stick, it was so bouncy. Granted, we weren’t doing much of a trot. But we did four or five little shuffle-y circles around Christy, and called it a night. I really want to ride more and better without stirrups. It’s the only way to develop a truly independent seat. And it’s sound practice and makes one a safer rider. 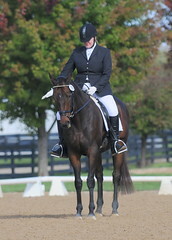 In particular, I’d like to be able to drop and pick up my stirrups – or adjust them when they slip – with ease. Tonight was the first step. So it was kind of a stupid ride tonight, but in the end, I had an important win. Tomorrow we’ll give another lesson a shot. I’m going to do some yoga and pilates, and gobble a couple Advil before heading to the barn. Hopefully I’ll put things together tomorrow night! I finally got back on a horse tonight – after a two week hiatus since our last ride – a good one which spawned the “Balancing Rein” post. To say I was happy would be really understating things. Mads felt great, and we got right to work once I had stretched out a bit and reconnected with all the muscles I hadn’t used while grounded. We had a lesson with Christy, who threw down the gauntlet by saying “Wouldn’t it be nice if we could pick up where we left off?” I made non-committal noises. I usually ride like a sack of freaking potatoes after time away from the barn. That said, I had taken some measures against complete atrophy while I was away. When I wasn’t laid up with the flu, I worked out, and did lots of squats with my toes turned slightly inward, to stretch and strengthen my hip muscles – those same muscles I’ve been working on developing in the saddle to support my new, improved seat. And it paid off – somewhat. My legs felt good and looked great, according to Christy. I wasn’t poking my toes out to the sides — I was keeping my leg softly against the side of the horse. That was good. However, after the first set of trot work, I was starting to feel winded. I stole a glance at the clock! 7:20! I had been riding just 20 minutes! Oh, Lord. I was going to be a long night. I couldn’t believe it. But at least we were managing to pick up close to where we left off. 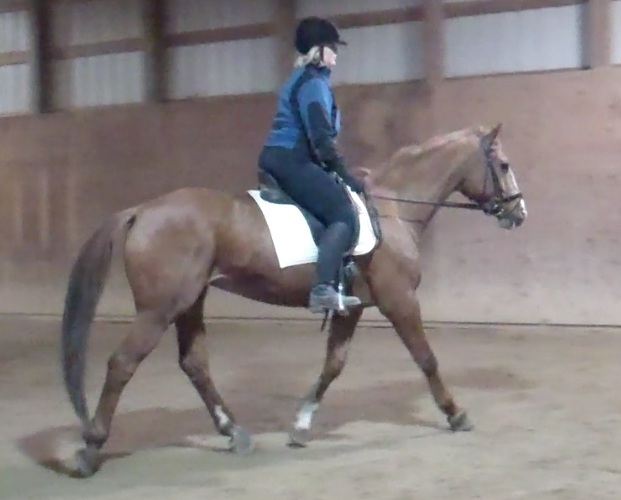 We practiced spiral in and spiral out, working on managing Mads when she leans on one rein. 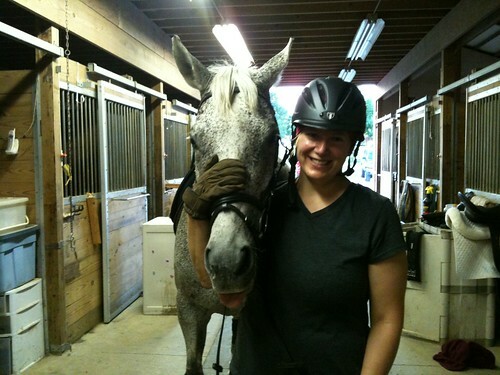 Christy had me soften the inside rein repeatedly while really holding the outside rein. We had some nice moments, but this still needs some work. I need to use my leg more actively to get the mare into the outside rein, and be faster with releasing when she softens on the inside. Anyway, I kept sneaking glances at the clock. Christy caught me this time. It was just 7:30, and I could feel my face reddening and my shirt growing more damp under my fleece. By 7:40, I was done. I suppose this is good from the standpoint that at least we know I’m really riding, using my whole body, and not merely going along as a passenger. And I now ride like this out of habit. So that’s cool. But man, it’s discouraging to be so wiped out after such a short ride. Onward and upward. The mare got a few extra alfalfa cubes in her mare mush. Hope she’s ready to go tomorrow! My plan for the rest of the week? Cruise around in two-point and do lots of posting tomorrow night, and really try to get some endurance back. Subject myself to Christy for lessons on Wednesday and Thursday.